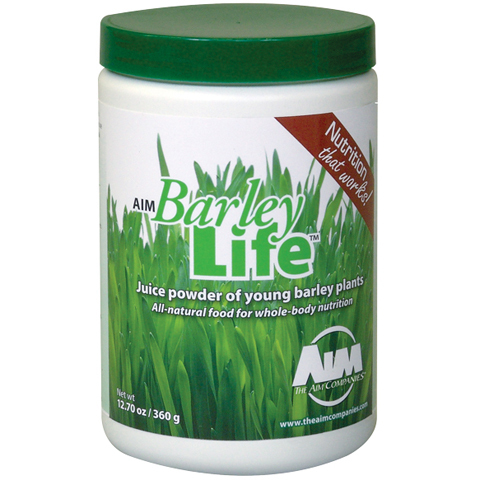 AIM BarleyLife® is an all-natural, green barley juice concentrate that helps provide the daily nutrition you need to develop a strong foundation for your good health. The power of AIM BarleyLife® is found in the nutrients of young barley leaves. 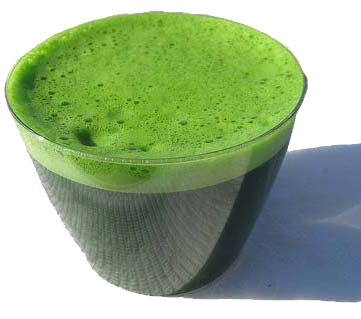 Research has found that green barley juice is abundant in enzymes, essential amino acids, and is rich in antioxidant ability, anti-inflammatory activity, immune system support and cholesterol lowering effects. All this and we've made this available with brown rice and kelp. The result is a feeling of total wellness! 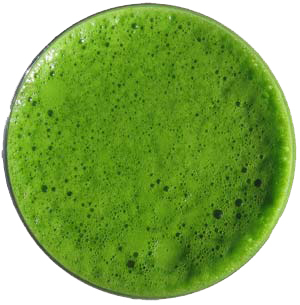 Some producers of green grass juice powder plant their crops, grow them until just before they enter the reproductive cycle, and cut the leaves when they contain the widest spectrum of nutrients. Then, instead of planting new crops, they simply allow the plants to continue growing and cut them a second time before they enter the reproductive cycle. Through laboratory analysis, AIM discovered that taking two or more cuttings from the same plants compromised their nutritional density. The nutrient levels in the second cutting were always less than the nutrient levels in the first cutting, and so on. AIM only takes one cutting from each crop so as not to sacrifice quality. Can I Take AIM BarleyLife® While Taking Medication? As long as your health practitioner has not forbidden you to eat salads or green vegetables, you can use AIM BarleyLife®. Is There Anyone Who Should Not Use AIM BarleyLife®? 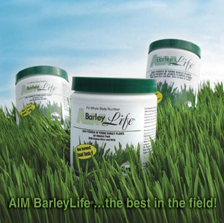 AIM BarleyLife® is a whole food concentrate, so most people should be able to take it. Those with severe medical problems or complications should consult a health practitioner before introducing something new to their bodies. Those on a restricted diet (especially in regard to “green foods”) should also consult a health practitioner. I Started Taking AIM BarleyLife® And I Feel Worse. Why? When you make a change in your diet, your body often goes through a cleansing known as detoxification. 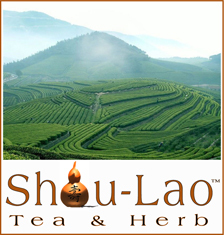 This can manifest itself in fatigue, rashes, and headaches. It is your body flushing out toxins. For more information, see AIM’s Detoxification data sheet. Maltodextrin is a soluble (dissolvable) complex carbohydrate that acts as a buffer to keep enzymes and other molecules apart so that they do not react and denature (lose their healthful properties). It is not a simple sugar (dextrose, fructose, sucrose, table sugar, corn syrup, etc.) and does not behave like a simple sugar. 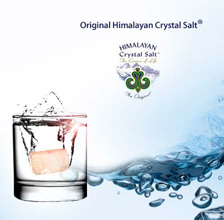 It can be derived from potato or cornstarch, and its starch component frees glucose across the human intestinal barrier in a time-release fashion over several hours, so no steep rise or fall of blood sugar results. Maltodextrin is used to help stabilize and protect AIM BarleyLife®. When the maltodextrin is sprayed on to AIM BarleyLife®, it forms a protective coating around the fragile nutrients. This shield is “broken” when you add a liquid and drink the product. The maltodextrin used in the organic formula of AIM BarleyLife® is certified as organic. Should I Be Concerned About Taking Kelp In My Diet? As long as your healthcare practitioner has not forbidden you to eat these foods, there is no reason to be concerned about taking kelp or brown rice in your diet. Those with food allergies, or those looking for a totally organic product, may prefer the organic AIM BarleyLife® without brown rice and kelp. The mission of The AIM Companies™ is to improve the quality and productivity of people’s lives by promoting the Healthy Cell Concept™ and the highest principles of free enterprise. This mission is further refined in the core values of The AIM Companies™, which reflect what must be realized to succeed. Individuals come form unique backgrounds and have had unique experiences; this means that they can make contributions that no others can. The AIM Companies™ respects individuals and all contributions they make. Meeting the customers' needs is the foundation of business success. If you meet their needs and respect them, you are guaranteed success. AIM provides an opportunity; it is up to the individual to suceed. We must always remember that organizations prosper not through their own work, but through the work of individuals within the organization. In 1982, a tiny company began a pioneering work, bringing a green barley juice product to the world. Today, that little company has grown to an active Member base of over 100,000 with hundreds of thousands of customers around the world and more than 25 meticulously crafted products.